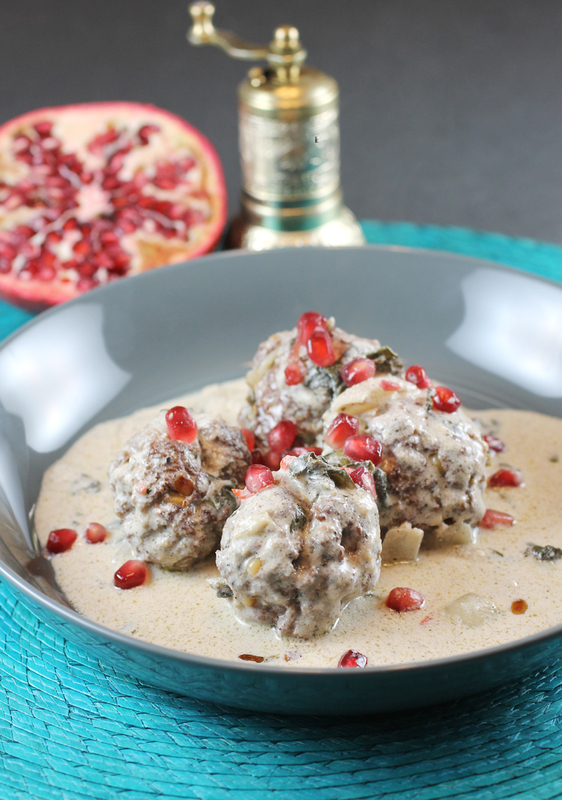 Meatballs bathed in a rich, warm yogurt sauce. 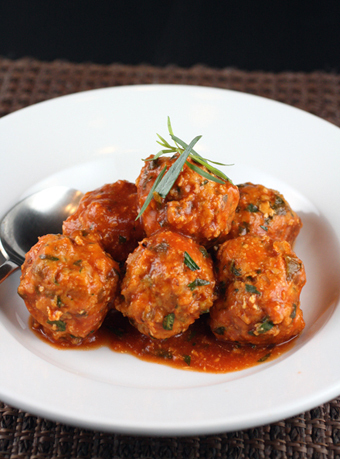 A great meatball is a fine thing. Especially one bobbing in a rich, creamy sauce that transports you from the first indulgent taste to a faraway land. 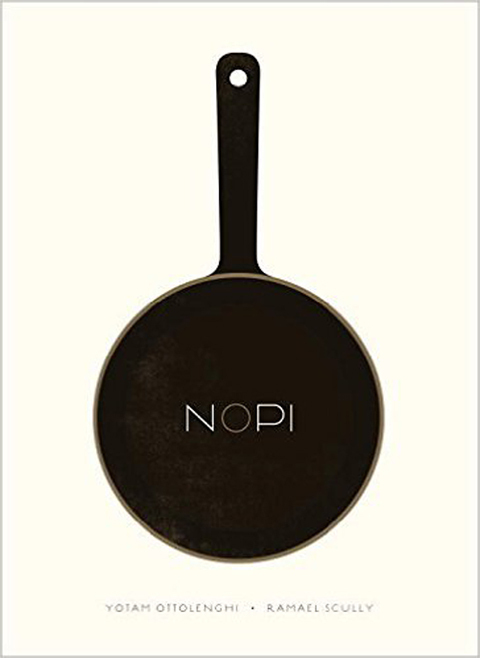 It’s from the new cookbook, “Nopi” (Ten Speed Press) by Yotam Ottolenghi and Ramael Scully, of which I received a review copy. Ottolenghi, of course, is the masterful owner of a slew of restaurants in London and the author of several cookbooks that pretty much land on the best-seller’s list every time he publishes one. Scully is his head chef of Ottolenghi’s fine-dining establishment, Nopi. The book contains more than than 120 recipes, combining Ottolenghi’s Middle Eastern roots with Scully’s Malaysian heritage. 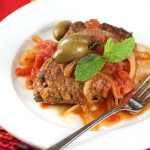 But if you look closely, you’ll also find a good number of recipes that are simpler yet still enticing, such as “Paprika Oven Fries,” “French Toast with Orange Yogurt,” and this one for meatballs. 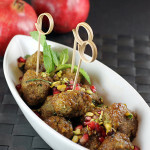 These lamb meatballs pack a flavorful punch with cinnamon, coriander, dried mint, allspice, garlic and pinenuts. If you don’t have dried mint, you can some finely chopped fresh mint leaves instead. These are not light, fluffy balls, but meaty, denser ones. They get seared before they finish cooking in a bath of Greek yogurt fortified with Swiss chard leaves and onion that have been kissed with chile and lemon. Go for the full-fat yogurt for this dish, too, as you’ll want its luxurious body and flavor. 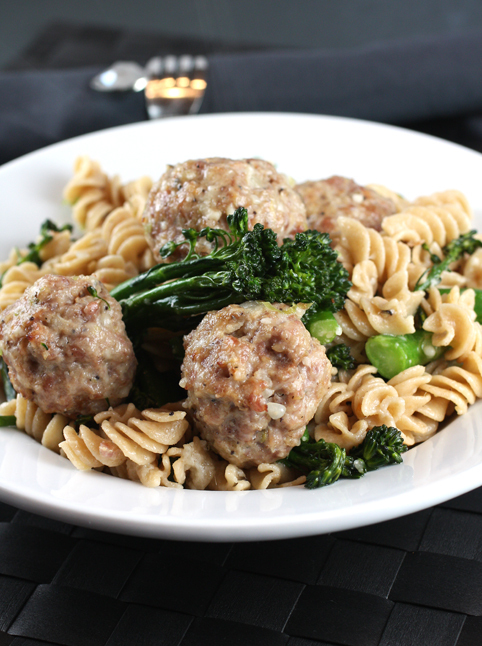 The dish can be made a day ahead; and it’s even more flavorful the next day. 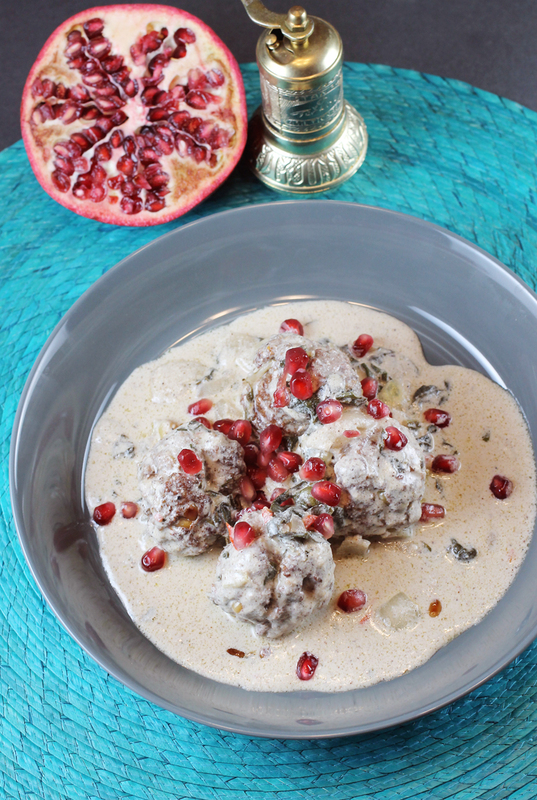 If the sauce separates when rewarming the next day, Ottolenghi and Scully recommend to just lift out the meatballs, add a spoonful of stock or yogurt, and whisk in before returning the meatballs to the pan and continuing to heat. Because you only use the leaves of the chard for this dish, they suggest shaving the white stalks raw into a salad or blanch the stalks and serve with olive oil, lemon zest, garlic and chile flakes. I chopped up the stalks, then sauteed them in olive oil until al dente, before folding them into an omelet for lunch the next day. 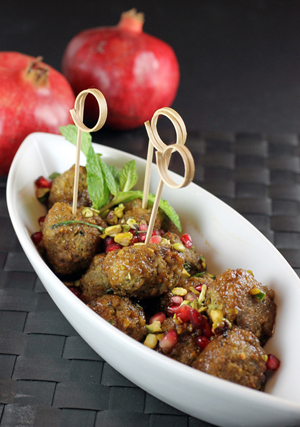 The pomegranate seeds or arils are optional. But do use them if you can because they not only add brilliant pops of color to the dish, but a nice sweet-tart fruity accent. The best way to remove the aris from a whole pomegranate without staining your fingers and clothing? I learned a great trick from Chef Ryan Scott of San Francisco’s Market & Rye, when I moderated his cooking demo recently in Yosemite. Cut the pomegranate in half through its equator. Hold one half, cut side facing down, over a bowl of water, while whacking it with the side of a wooden spoon. The arils will dislodge and fall out into the bowl of water and sink. Any pith will float to the top, making it easy to remove by scooping out with your fingers. Drain the arils through a sieve, and they’re ready to use. This dish with its heavenly sauce cries out to be served with a big mound of fluffy, fragrant basmati rice. 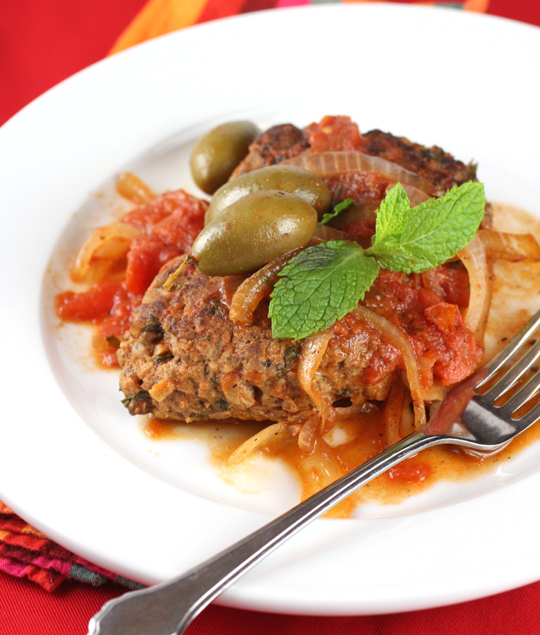 Dig in and enjoy an exotic taste of Persia in your own home. Place the first six ingredients in a large bowl with half of the allspice, half of the garlic, 2 teaspoons of salt, and 1/2 teaspoon of black pepper. 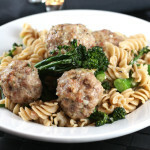 Mix well, then shape into 2-inch meatballs, weighing 3 1/2 ounces each. You should make about 24 balls. Heat 2 tablespoons of the olive oil in a medium saucepan with the onion and the remaining garlic. Fry over medium heat for 8 to 10 minutes, stirring from time to time, until the onions have softened but not taken on any color. Add the chile and chard and cook for 2 to 3 minutes, until the chard has wilted. Stir in the remaining allspice, along with the chicken stock and lemon juice. Bring to a boil, then remove from the heat. Place the yogurt, cornstarch paste, and egg in a large mixing bowl with 2/3 cup of water. Whisk well to form a smooth paste. Gradually spoon the hot chard mixture into the yogurt, stirring well after each addition, until the two mixtures are combined. Add 2 teaspoons of salt, along with a good crack of black pepper; stir, and set aside. Pour the remaining oil into a large, high-sided saute pan and place over medium-high heat. Add half the meatballs and fry for 4 minutes, turning a few times so that all sides get browned. Remove from the pan and repeat with the remaining batch, adding a little bit more oil if you need to. Wipe out the pan and pour in the yogurt sauce. Bring to a very gentle simmer over medium-low heat — it should barely be bubbling — stirring continuously in one direction to prevent the yogurt from curdling. Return the meatballs to the pan — they should just be covered with sauce — and cook over low heat, covered for 20 to 25 minutes, until the meatballs are cooked through. 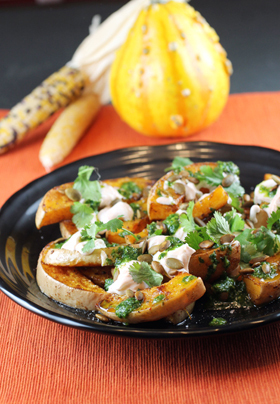 Serve at once, while the pomegranate seeds and cilantro sprinkled on top. 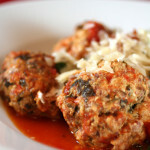 These are meatballs! What a terrific dish — so full of flavor, and so nice to look at. Sounds like a terrific book, too. Thanks! 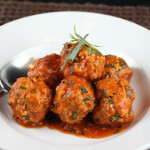 oh, what great spices and herbs to flavor those meatballs! 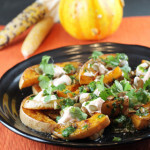 like everyone else, i’ve become a pretty big fan of mr. ottolenghi! Oh my gosh! Looks like chiles en nogada! A must try! Love this recipe. The measurements for the meatballs are wrong, though. 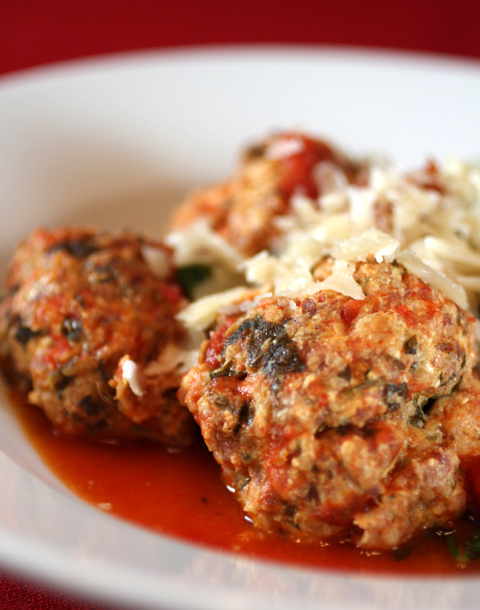 The original calls for 24 50-gram meatballs. That’s about 1.7oz each, not 3.5oz. There’s not enough mix to make the meatballs to the specs listed here. Laura: I took the recipe right out of the cookbook. Those are the stated measurements/amounts. I don’t recall how many meatballs I ended up with, but I think it was around 24. However, I did not weigh them; I just free-formed about 24 of them so that they were approximately 2 inches across.